When the race to walk on the moon began it was first considered to be a ludicrous notion ( and even today there are a few who believe it was all a hoax) but scepticism and disbelief don’t deter the truly brilliant. 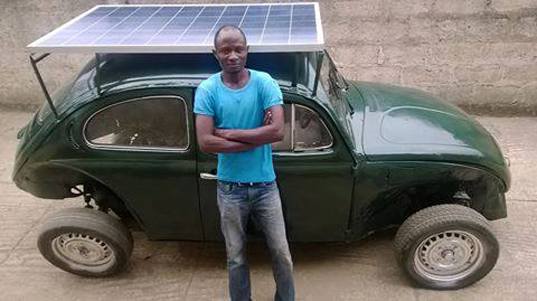 Without a shadow of a doubt, Nigerian born Segun Oyeyiola faced the same kind of scepticism when he turned his gas guzzling Volkswagen into a fossil-fuel free machine by installing a giant solar panel on top and a wind turbine under the hood. 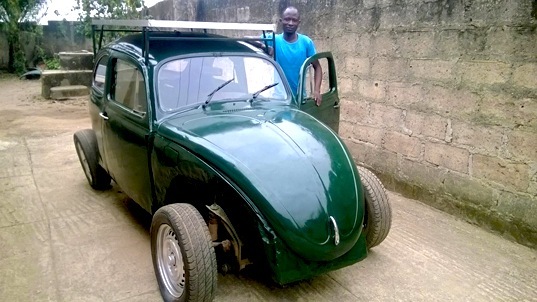 Oyeyiola completed the project for just $6,000 using mostly scrap parts donated by friends and family, proving that everyone can make a difference with the right attitude and a bit of ingenuity. Oyeyiola still has improvements to make on his vehicle and he’s determined to make it perfect. He has faced a fair amount of criticism from some of the people in his area, however he is determined to succeed and see if his prototype can be turned into something that can be used by many people in the near future.